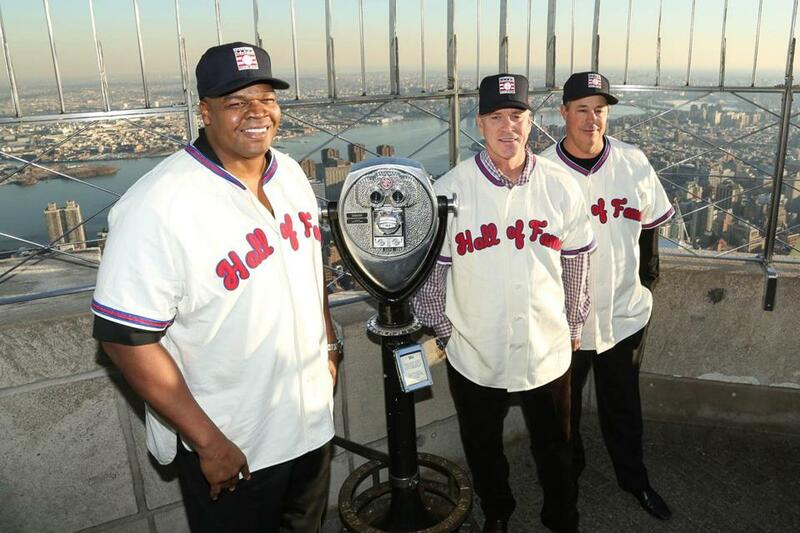 Baseball Hall of Fame voting in need of change? While the voters did not elect anyone for induction in 2012, the selection of Greg Maddux, Tom Glavine, and Frank Thomas last Wednesday should help alleviate some of the congestion. The Baseball Writers’ Association of America has formed a committee to discuss, and possibly recommend changes to the Hall of Fame voting system. The committee, of which I am a part, has not yet met, but the recent logjam of worthy candidates for induction has created interest in some circles to expand the ballot from the maximum 10, allowing voters to cast ballots for as many players as they like. The logjam was created by recent players who have accumulated Hall of Fame-caliber statistics, as well as players who have been suspected of or known to use performance-enhancing drugs, players who normally would have been automatic selections but are now being questioned. It’s expected that newcomers John Smoltz, Pedro Martinez, and Randy Johnson will get in next year, and there’s the possibility that Craig Biggio, who missed this year by two votes, will gain entry. In 2016, Ken Griffey Jr. is eligible. 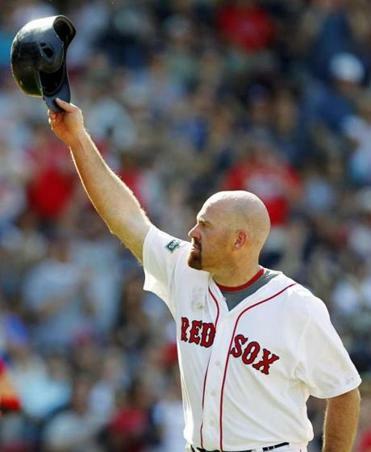 Former Red Sox All-Star infielder Kevin Youkilis last month agreed to a one-year deal to play for the Tohoku Rakuten Golden Eagles, the defending Japan Series champions. Youkilis, who played only 28 games last season with the Yankees because of back problems, is the fifth Red Sox All-Star to wind up in Japan. After this logjam, candidates previously falling short, such as Mike Piazza, Jeff Bagwell, Jeff Kent, Tim Raines, Mike Mussina, Curt Schilling, Larry Walker, and Lee Smith should see their vote totals start to rise. While the totals of Roger Clemens and Barry Bonds went down this year, their totals may also rise as the logjam clears. Since this reporter began voting in 1994, this was the first year that the 10-vote maximum became a factor. As BBWAA secretary-treasurer Jack O’Connell points out, voters submitted full ballots 22 percent of the time in 2012, and that percentage rose to 50.3 in 2013. But in O’Connell’s 20-year tenure, ballots have listed five to six names on average. So, the committee must determine if change is necessary. Times have changed, and perhaps the Hall needs to change as well. Then again, compared to Halls of Fame of other major sports, the system seems the fairest. One could argue that others besides eligible sportswriters should be allowed to vote. It’s long been suggested that broadcasters — at least those who have broadcast for 10 consecutive years — be eligible. The stigma attached to broadcasters is that they can’t be impartial because most are paid by the teams. This has to be reviewed at a time when teams are owned by people who also own media outlets (for example, the Globe is owned by Red Sox owner John Henry). Also, the growing reliance on advanced statistics by teams has resulted in some media who use mainly statistical analysis to evaluate players. Just as teams now combine scouting and analytics, should the Hall of Fame now include a combination of traditional media and new-age media who rely more on statistics? The likes of Bill James, John Dewan, and Dave Cameron could form a new voting block that if combined with the traditional block could strike a good balance. Most of the statistical gurus I’ve come across minimize steroid use as a factor in voting. There’s a feeling that older voters denounce steroids more than younger ones, but there are 80-year-olds who voted for Clemens and Bonds. Those of us who consider ourselves traditionalists also use statistics. My ballot, for instance, named Clemens and Bonds because the greatest players should be in the Hall. Bonds and Clemens were arguably the greatest hitter and pitcher of their generation, which was the heart of the steroid era. It depends on how you deal with this era — ignore anyone who played in it, or decide that the playing field was level (with a good majority of players using) and vote accordingly. There were plenty of reserve infielders who took steroids who never rose above reserve infielder. The extraordinary talent exhibited by Bonds and Clemens can’t be taken away. Was using performance-enhancers right? Of course not. But it was the reality of the era, just as amphetamines were the reality of the 1950s and ’60s. How many “old-timers” boasted that they needed “greenies” to stay focused after a long night at the bar? Were their stats enhanced because of those pills? Does a two- or three-year logjam create this need for change? It’ll be up to the Hall of Fame to take our recommendations under consideration. The Hall “system” values the input of qualified BBWAA voters who watch the games and the players, who interact with the personalities, and who have information on things such as work ethic of a player and a player’s personal commitment. The Hall of Fame, as Harold Reynolds of the MLB Network points out, “should be hard to get into.” By limiting the ballot to 10, it’s hard to get into. Tough choices have to be made. When a player such as Jim Rice gets in on his 15th try, that means the voters have gone through an evolution of more than a decade of scrutiny, comparison, soul searching, and review of his career. It was a hard decision for most to vote Rice into the Hall of Fame, but in the end his dominance over a long period, and the fact there was no steroid issue, got him over the 75 percent hump. This is the great thing about the traditional media — a candidate can grow on them over time, while those using statistical analysis see things in black and white. As time goes by, the voter has become a hybrid of these two worlds. There’s room for both. 1. The Red Sox have had one of the quietest offseasons I can remember for a championship team. There’s virtually no news, which is not a complaint or a criticism, just the reality. David Ortiz’s future contract talks, Stephen Drew’s free agent status, and the possibility of dealing one of the starting pitchers have been the most compelling topics of the winter. 2. The Astros have a few things to do. They need to figure out their spring training situation in the Palm Beach area, where owner Jim Crane is trying to move the team from Kissimmee and perhaps share a facility with the Blue Jays. Right now, there’s a bit of community balking over their plan. They also need to get their television contract straightened out and begin to increase their season-ticket base. The Astros need a splash, maybe even with Masahiro Tanaka. They were legitimate contenders for Cuban first baseman Jose Abreu, but lost out to the White Sox. 3. I like the Oakland Athletics a lot. I’d like them better if they signed Drew and moved Jed Lowrie from shortstop to second base. 4. You talk about the Red Sox adding Edward Mujica so they have a backup closer to Koji Uehara, but how about the bullpen Ned Colletti has assembled? In addition to closer Kenley Jansen, the Dodgers have Brian Wilson, Chris Perez, and Brandon League, just in case. 5. Since the Orioles backed out of a deal with reliever Grant Balfour after discovering shoulder trouble during his physical, the 36-year-old hasn’t hooked on anywhere else. 6. Curious to see how Ryan Braun looks on the field after his long PED suspension last season. Braun, who will play right field for the Brewers, has seen his OPS dip each of the last two seasons. 7. David Segui, who acted as a hitting coach for Manny Ramirez, said he hasn’t spoken to the former Red Sox star in more than two months. Ramirez wants to continue playing and is trying to hook on with a team. “Manny will always be able to hit,” Segui said. “He loves to play, so it wouldn’t surprise me if he’s still looking for something.” Ramirez’s contemporary, Jim Thome, also resisted retirement to the bitter end. Agent Scott Boras scoffs at the notion that there’s no market for client Stephen Drew. “There are five or six teams who I have actively talked to concerning Stephen,” Boras said. “Ben [Cherington, the Red Sox GM] and I have continued our dialogue and will continue to talk.” Then, why no agreement? There’s no doubt the Red Sox want Drew back. They have publicly stated that. They’d prefer a one-year contract, but Boras is pushing for a two-year deal. One of the factors for the Red Sox is Drew’s veteran presence and the fact that they would be going into the season with rookies up the middle in Xander Bogaerts at shortstop and in Jackie Bradley Jr. center field, and then another young player, Will Middlebrooks, at third base. Can you win with rookies up the middle and an inexperienced player at third? That’s the Sox’ dilemma. Boras represents Bogaerts and Bradley as well, and also represents Boston’s other young star shortstop, Deven Marrero, who will likely play the position in Boston in the future as Bogaerts moves to third, first, or even the outfield over time. Boras has a tremendous stake in the Red Sox’ present and future. Drew could remain as the bridge to Marrero, an excellent fielder who is projected as a .260-.270 hitter in the bigs, while Bogaerts would be able to move from shortstop to a less-demanding defensive position so he could concentrate on his abundant offensive talents. We’ll see how it turns out, but the Sox’ staff is rooting for Drew’s return. 1. Clay Buchholz, RHP, Red Sox — GM Ben Cherington said that Buchholz has gone through a “normal” offseason and should be ready to go by spring training. Buchholz spent almost three months dealing with a neck/shoulder strain last season, but returned in time to pitch Game 4 of the World Series, throwing 88-89 miles per hour. Buchholz proved to himself that he could get major league hitters out when not feeling 100 percent, a trait new Hall of Famer Tom Glavine exhibited throughout his career. The Red Sox’ hope is that Buchholz comes back stronger and more able to withstand injuries that tend to keep him from being one of the top pitchers in the game. 2. Masahiro Tanaka, RHP, free agent — “Someone is going to come in and blow everyone away,” said one National League GM. “There’s going to be a dance where everyone is in the same boat and then there will be a team that breaks the bank for him.” And then you ask, is Tanaka worth it? There’s growing sentiment he would be worth it for rebuilding teams such as the Cubs, Astros, Blue Jays, Mariners, and even the Padres. He’s also worth it for teams with big bucks such as the Dodgers, Yankees, Red Sox, Angels, Phillies, and Tigers. 3. Lyle Overbay, 1B, free agent — He remains on the Astros’ short list of low-cost first basemen. The Astros would love to have a veteran who could push Brett Wallace. Overbay had a good 2013 season with the Yankees and in many ways saved their lineup after Mark Teixeira was lost early in the season. Overbay remains an option for the Brewers, as does Michael Young and Rangers reserve Mitch Moreland. 5. Bronson Arroyo, RHP, free agent — Action was picking up on Arroyo by Friday afternoon. Two new teams were involved, according to a source close to the situation. Arroyo was still seeking three years, and at least one team was moving closer to offering a deal for that third year, either through a vesting option or straight up. A lot depended on the average annual value of the contract as to whether the mystery team was willing to offer a third year. The Twins are one team that has been involved from the outset, but it wasn’t immediately known if they were the team moving toward the third year. The Yankees and Phillies were also interested. 6. Derek Holland, LHP, Rangers — Big blow for Texas losing its talented lefty when he hurt his knee falling down stairs in his house. After surgery, he’ll be out until around the All-Star break. The Rangers may now be scouring the market. They could get in on Arroyo, who is a non-compensation free agent. The Rangers didn’t have interest in bringing back Matt Garza. 7. Suk-min Yoon, RHP, free agent — The Twins and Red Sox remain engaged on the talented Korean righty. According to research done by Tim Dierkes of MLBTradeRumors.com, the 27-year-old was second to Dodgers lefthander Hyun-jin Ryu in Korea. Dierkes indicated that Yoon’s breakout season was 2011, when he had a 2.45 ERA and an excellent strikeout-to-walk ratio of 9.3-2.3 per nine innings. Yoon also has experience as a closer. Boras said that rumors of an arm injury in 2013 are untrue. “All of the teams have the medicals on him, so they know that he’s healthy,” Boras said. 8. Johnny Damon, OF, free agent — Boras said he asked Damon to let him know when he was all done. So far, Boras hasn’t heard those words from Damon, meaning Damon would love to resume his career after missing last season. Damon has remained in shape and would be willing to hook on if someone called. From the Bill Chuck files — “In 300 games in 2011-12, Dustin Pedroia grounded into 21 double plays. In 160 games in 2013, Pedroia grounded into 24.” Also, “In 1,466 games, Lyle Overbay has 342 doubles. In 1,374 games, David Wright has 345 doubles. In 2,401 games, Mickey Mantle had 344 doubles.” . . . Happy birthday, Mike Marshall and Mike Trujillo (both 54).